The passing of the second reading of the budget by a comfortable majority is of political and economic significance. It ensures political stability for about a year till the next elections and is indicative of party positions. The economic impact of the budget would depend much on the effective implementation of the announced policies and programmes. However, its fiscal deficit – which is larger than the planned fiscal targets — would have an adverse bearing on economic stability and economic growth. The second reading of the 2019 Budget was comfortably passed in Parliament on Tuesday with 119 members voting for it and only 76 voting against it. The 29 abstentions have unpredictable political implications. Also several parties that opposed the budget either voted for it or abstained from voting. Consequently there were only 76 votes against the budget. The vote was a convincing victory for the UNF government. It was a reflection of the parliamentary strengths and party affiliations in parliament rather than one based on the merits of the budget and an evaluation of its impacts and economic consequences. MPs from the United People’s Freedom Alliance (UPFA), Joint Opposition and the Jathika Vimukthi Peramuna (JVP) voted against it. The Tamil National Alliance (TNA) that criticised the budget and the two Opposition MPs from the Ceylon Workers’ Congress (CWC) also voted with the government. Significantly, 29 MPs were absent at the time of voting. These included a number of prominent MPs from the Sri Lanka Freedom Party (SLFP) led by President Maithripala Sirisena. They included Chief Opposition Whip Mahinda Amaraweera, Sri Lanka Freedom Party (SLFP) General Secretary Dayasiri Jayasekara, Nimal Siripala De Silva and Duminda Dissanayake. The political implications of this would unravel in due course. The voting pattern was of much political significance as it reflected the political positions of parties rather than a considered and studied view of the impact and consequences of the budget. Once more the six-day budget debate demonstrated that the country’s budgets are a political exercise and that political rhetoric, rather than economic imperatives fashion fiscal policy. Nevertheless, there were some views of significance for the economy. One member was truthful when he said that whether you blame the previous government or this government, the plain truth was that continuous fiscal deficits of governments have increased the national debt to an unbearable level. This applies to both domestic debt and foreign debt that are massive. And their debt servicing costs absorb a large proportion of government revenue and export earnings. Although the issue of huge losses of state owned enterprises (SOEs) did not figure prominently in the debate, the massive losses of SriLankan Airlines and Mihin Lanka under the previous regime, as well as in the past four years were brought up by former Finance Minister Ravi Karunanayake. The SOEs losses are a vital issue that should have been addressed in a comprehensive manner as the fiscal burden caused by more than 300 lossmaking enterprises is a matter of grave fiscal concern. This issue has been swept under the carpet for political reasons. Hopefully the reform of state enterprises would be a priority after the elections, whoever forms the government. In spite of several important observations and criticisms of the JVP on the budget, its economic policies are still moribund socialist policies that have been abandoned by socialist countries themselves. Is this due to their ignorance of the market-oriented policies that erstwhile socialist countries, such as Russia, China and Vietnam follow or is it because of the political appeal that these policies have in the country? Not surprisingly, the SLFP general secretary, who abstained from voting, announced that the party would forge a socialist front. Once again this demonstrated the moribund ideological positions that hamper the country adopting pragmatic economic policies. 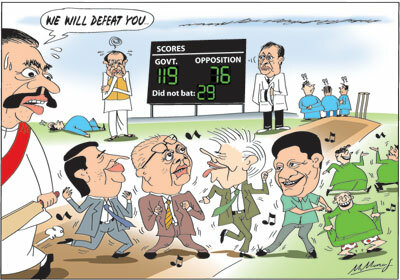 It was also the divergence between these policies and those of the UNP that crippled the coalition government. Is it ignorance or blind ideological commitment that makes the SLFP espouse these detrimental policies especially for a small island economy? It appears that the SLFP is intent on following economic policies of the pre 1977 era rather than the enlightened SLFP policies of the 1994 Chandrika Bandaranaike Kumaratunga government. These policies were characterised as “Continuity with Change” and “Structural Adjustment with a Human Face”. The policies of that SLFP regime included the privatisation of management of plantations that were making huge losses, privatisation of telecommunications and partial privatisation of SriLankan Airline. The government’s revised target to keep the budget deficit at 4.4 percent of GDP will be a challenging task, as there are possibilities that the fiscal deficit would increase owing to expenditure overruns as the government is likely to increase expenditure to enhance its popularity in the run-up to elections. The setback to the process of fiscal consolidation will have serious consequences for public debt; it will be inflationary and weaken the trade balance and balance of payments. Consequently, the country’s external vulnerability will be weakened further. It is vital for the revenue enhancing fiscal consolidation that was in place be continued and that at least the revised higher fiscal deficit of 4.4 percent of GDP is achieved in 2019. Any deviation from this target would erode international confidence, flout conditions for the expected new Extended Fund Facility of the IMF and destabilise the economy. One of the ways by which this could be achieved is that despite the budgetary rhetoric of spending large sums on wasteful and unproductive programmes like Samurdhi and subsidies, the government prunes these expenditures in their implementation. Under-expenditure on these items is a way out of the fiscal slippage. On the other hand, there is every prospect that in a bid to placate the electorate, there would be overruns in expenditure owing to additional benefits and government expenditure that are not included in the budget estimates. All things considered, one cannot escape the conclusion that the Sri Lankan political milieu is antithetical to good fiscal management. If the government is unable to reform its large number of lossmaking enterprises; if poverty alleviation measures that do not reach the poor cannot be curtailed; if the government seeks to employ unemployed educated youth in unproductive employment; and expend large sums on parliamentarians and an unwieldy number of ministers, then fiscal consolidation is well-nigh impossible. The chronic large fiscal deficits have led the country into an enormous debt burden. Debt servicing absorbs nearly the entirety of revenue that in turn distorts public expenditure and development expenditure. It is in such a context of public finances that there has been further extravagant spending on welfare measures.